Home/Focus/Living/Health and Wellness/Jamming for your practical exams? How VR can help to reduce stress and exam anxiety – Really! Yes we’ve all been through it before, and wish that there was an easier way to perform better under stress. The video shown was created by the University of Alberta team to demo of a scenario example of how students would use the demo to learn and reduce anxiety for their clinical practical exam. Dr. Shaniff Esmail and Mary Roduta Roberts at the University of Alberta, Faculty of Rehabilitation Medicine, noticed that occupational therapy students were suffering from test anxiety when they were about to perform their clinical practical exams. So, they recruited Brendan Concannon a graduate teaching assistant to help them to build out the research and VR program. 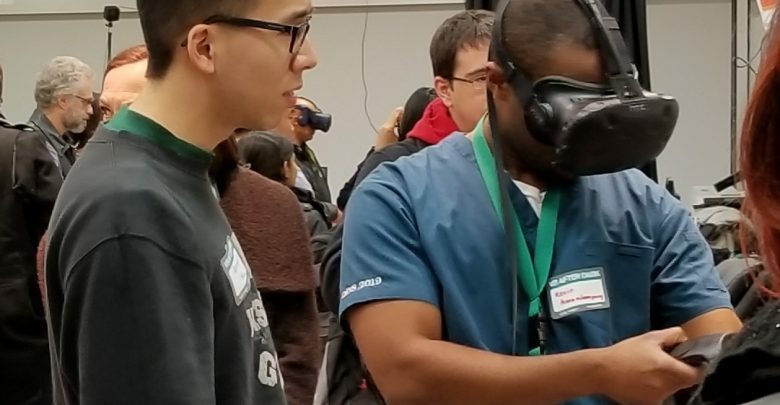 In order to help the students prepare, they created a virtual reality simulation of the clinical practical exam setting. The students have been using it to supplement their course materials, mainly to mentally prepare for their clinical practical exam. We interviewed Dr. Martin Ferguson-Pell on the technology background, and Brendan ConCannon on how students learn from this VR program. Martin, can you tell us about how AI and natural language processing enabled the Robotics Lab team to create the VR simulations for clinical practical exam application? In our Occupational Therapy Objective Clinical Structure Exam (OSCE) example we were able to combine a traditional VR experience with natural language processing and AI to enable a student to practice a clinical exam, before doing the real thing. We know that our students experience very high levels of anxiety before taking their OSCE exam. They have to interview standardized patients (actors) to demonstrate both the clinical diagnostic skills and also their interpersonal, emotional intelligence skills. We are concerned that what we are actually examining is a student’s ability to manage the anxiety, rather than their clinical know how. Our OSCE VR experience enables students to practice with an AI-enable avatar. The Q&A associated with an OSCE tests their clinical knowledge and if they wish they can review their interactions critically before taking the OSCE exam proper. The response so far has been very positive and students in other health disciplines who have to take similar exams are beating a path to our door, asking us to create similar simulations for them. The wider scope to use these techniques for other examinations, interviews and anxiety raising situations we believe is quite large, and success in their development will hinge on how immersive and realistic we can make the experiences, and particularly the interactions with the avatar. Brendan, can you explain the premise of the clinical video as to how it assists to reduce stress and anxiety for the student – in this case a practical exam in a clinical setting using an avatar as a clinical patient? Practical exams, which are frequently used to assess student clinical competencies, can be highly stress-inducing. Our virtual reality simulation features a patient avatar who is artificially intelligent. She responds to basic interview questions that are like the actual clinical practical exam setting. When the students practice by asking questions this way, we expect them to develop procedural strategy, reducing their test anxiety. The triangulation of quantitative and qualitative results are expected to relate to anxiety levels, mental levels of preparedness and exam preparation strategies. Focus groups and interviews were also conducted to better understand students’ experiences of anxiety and practical exams. Brendan, so your VR program can be adapted to other high stakes exam situations in the future? Can you share what still needs to be developed in your virtual simulation programs? In the future, we expect further development of our virtual simulation so that it may be used to increase clinical skills in occupational therapy students. Right now, our simulator is not powerful enough, because the patient avatar can only respond to basic questions and commands. We need to increase the avatar’s communication ability by improving her body language, mood and personality. We also need to expand the number of questions she understands. This is amazing! Already we can see potential opportunities where safety and procedures would apply to other clinical situations, like surgery, and even to other industry sectors – opening a gateway to future occupations and interdisciplinary collaborations! Yes, should this virtual environment application be successful, other health related disciplines such involving psychology, nursing and client-centered-therapy could benefit from this type of virtual mental preparation. Our virtual environment has a multidisciplinary origin. When you say we’ve had potential collaborations, you are absolutely correct. We conversed with the Computer Sciences discipline (Robotic Lab at the University of Alberta), to arrange for this virtual environment to be developed. It is becoming more common for engineers, computer scientists, design thinkers, journalists and artists to consider immersive virtual reality for their training and/or interdisciplinary collaboration. Brendan, looking forward to hearing about future updates on the progress of your current VR program and hopefully expansion into other disciplines in the future! The University of Alberta is home to North America’s only freestanding Faculty of Rehabilitation Medicine. We are a world-class post-secondary institution that provides academic training in rehabilitation science, physical therapy, occupational therapy and speech-language pathology. A research leader in musculoskeletal health, spinal cord injuries, cardiopulmonary rehabilitation, chronic pain management, seniors health, and the application of information and communication technologies to support community care; we are the institution of choice for rehabilitation professionals, researchers, students and scientists. Shaniff Esmail, PhD, MSc is the Associate Chair Rehabilitation Medicine Occupational Therapy. Mary Roduta Roberts, PhD, BScOT is the Assistant Professor, Rehabilitation Medicine, Occupational Therapy. Brendan Concannon, Graduate Student, University of Alberta.